We are well known as the Manufacturers of a wide range of LML Vespa Side Panels that are of high quality. Our Side Panels are available in several specifications to suit the diverse industry requirements. 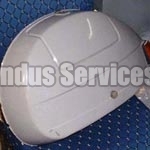 Clients can avail the LML Vespa Side Panels at market leading prices from us.